It is now the end of June in 1945. George Edwin Farrar had been liberated almost two months before on May 2. Since liberation, he had been for a time in a hospital in France and was now in England. He expected to leave for the states in the immediate future, leaving England that night. This will be my last letter from England, as we are leaving to-night. I will call you the first chance I get, after we reach the States. It will take a good while to cross, as we are going to be on a very small ship. It will be nice to cross on a ship, as you know I have never been on one before. I can’t hardly wait to get home. There is so much I want to hear from you. I guess it will be like living a whole year in one day. It has been one year today that I left the States. I wouldn’t be surprised if Gene hasn’t a nice girl by now. He should be about old enough, and I know with his looks, he is getting along O.K. I guess you are still about the only girl I have, and I love it. I can just thank God that I didn’t have a girl to worry about while in Germany, on top of all things else. Well there isn’t anything else to write about, so will close here. Erwin Foster was the original ball turret gunner with the Buslee crew. 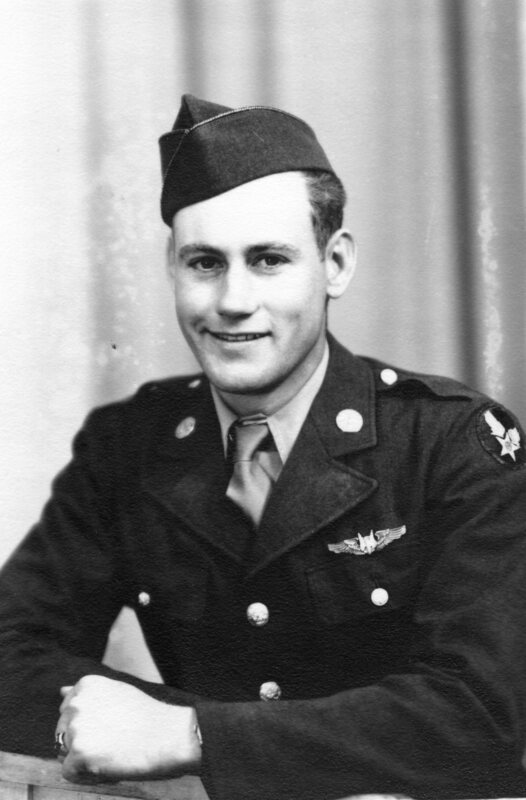 He trained in Ardmore, Oklahoma with Sebastiano Peluso and served with him on eight missions in WWII. Foster was not on Lead Banana on September 28, 1944 and finished his tour with the 384th on April 22, 1945. Foster was from Elmira, New York, a city in upstate New York about four hours (today) from the Pelusos in Brooklyn. After returning to the states, Foster visited the Pelusos the weekend of June 23 – 24, 1945. I dislike having to inconvenience you this way – but I would deeply appreciate a letter from you, with all the information your dear son can possibly think of. He most likely is home by this time. I know it’s the hardest mission for him, but as I have said in my previous letters, it means so very much to my family. We haven’t received any news from the war dept. S/Sgt. Irwin Forest visited us over the weekend. Naturally there wasn’t much he could tell us for he did not go on that mission. It was good seeing one of Yono’s buddies. Mrs. Farrar if George finds it hard talking about what happened Sept. 28, my husband would be only too glad to see George personally. Please let us know soon. You see our hope for Yono’s return is high and deep. We know he’s safe and any information would help us. We of course haven’t overlooked the other side of the story. I’m sure you won’t let us down. The Pelusos thought that George Edwin Farrar should have been home by this time, but he had not, in fact, yet left the ETO. Lenard Leroy Bryant’s wife, Maudene, wrote to Mrs. Farrar a couple weeks later. It was hard to keep things straight in her mind when her mind was so filled with thoughts of her husband. Lenard had been the top turret gunner on Lead Banana on September 28, 1944. Maudene had received news that Lenard had been killed that day, and if she were to believe the news, had to plan for a life without him. Just a note to let you know I am so glad George has been liberated & will be so glad when he gets home. Sometimes I think I’m not all here. I can’t remember if I answered your last letter or not. Ha. I don’t know what folks will do here. We haven’t had a rain this year. Three more months I will be out of school then I will have a good job. I wish it were possible for George to make a trip out here. I am sending a picture of Lenard. George Edwin Farrar’s mother must have recently written to the families of all of the boys who were on the Lead Banana on September 28, 1944. They appreciated her sharing her news of a letter from her son. He had written that he had been liberated and would be coming home in the near future. Raleigh Mae Farrar’s backyard now boasted a large vegetable garden and was populated by forty-two chickens. Her plan was in place to nourish her son back to health when he arrived home from the war. She had recently received letters from the Buslees, the Albrechts, and the Pelusos. The next letter to arrive was from the Stearns, parents of Lead Banana bombardier Robert Sumner Stearns. How happy we are over the wonderful news you’ve had from your son, George. I hope he will soon be home with you, safe and sound. What a terrible experience he must have had to be in prison all these months. A cousin of ours was captured in the break-through in January and put to work on a Railroad crew on 2 slices of black bread and 1 qt. of soup a day. He lost 65# in those few months, but is now home and going to be alright. Luckily he was not injured. I surely hope George fared well and was not mistreated. We’ve appreciated all the good letters you’ve written us so much as realize you’re busy and have been so worried over your boys. I’m so glad the son who was in the So. Pacific is home with you now – you really have been very lucky to have both boys home after all they’ve been through. I hope your son who was in India is well and that you hear from him often. We have had no word from anyone of the crew’s families except you so I presume they have heard nothing. There are still a few prisoners yet to be liberated from Russian held territory, I read in this week’s paper, so maybe some of us will hear something yet, as long as there is a shred of hope, or chance that they are somewhere alive we will keep looking for news. Our weather has been very rainy and cold the past month so everything is green and pretty. The gardens are slow, tho – in fact some of ours isn’t planted yet, the ground is so wet. Today was nice and sunny so perhaps we are going to have some warm weather. How nice to have all those fryers ready for George’s home coming. I can imagine you enjoying cooking them for him almost as much as he will enjoy eating them. Bobby’s favorite meal was beefsteak, mashed potatoes, gravy, hot biscuits and a green vegetable salad, which he could cook very well himself, all except the biscuits. I read where the boys in the prison camps planned what they were going to eat and fishing trips they were going to take when they got home. Took their minds off their surroundings, they said. We are able to get meat whenever we have the points for it here, but we are in cattle country. May make some difference. Can’t have much choice at times, tho, but no one goes without. We are anxiously waiting to hear from you again as to what really happened the day of the accident, and just where it was. We have heard two different versions, but realize how hard it was for so many accidents to be kept straight. So we will watch the mail and be forever grateful to you for sending all the good letters to us. The following day another letter arrived at the Farrar home, this one from the parents of Lead Banana radio operator, Sebastiano Joseph Peluso. Peluso was the only crew member on Lead Banana on September 28, 1944 to have not been accounted for. His parents were desperate for some news of their son. Your lovely letter arrived yesterday. I can’t put into words how grateful I am hearing from you. For awhile I was beginning to think my letter never reached you. For such incidents do occur. It must be quite difficult having to write all the crew members families, the information your dear son George will have for us. But your being a mother of three sons, can easily be understood how much this little information will mean to our families. I haven’t received any news concerning my dear son Yono. The only thing I have received, was a letter from the war department with a check for $32.00, which was found among Yono’s belongings back in England. I believe that any day, I will be getting all his personal belongings since they send the money that was left behind before going on their mission. While listening to the news on the radio this morning, I did hear something which gives me higher hopes. The commentator said – 25,000 soldiers who have been listed as “Missing in Action”, are on their way home. Next of kin haven’t been notified as yet. I hope and pray, with heart and soul, that my son is among the bunch. I do have very strong feelings that some news will come before this month ends. Mrs. Farrar, I’m so happy for you, that your dear son is on his way home. May he be home by the time this letter reaches you. My sister is expecting her son home any day now. He was held prisoner of Germany for 16 months. He has a little boy 2 ½ years old that he has only seen once – when he was 4 months old. I received a letter from Mr. Buslee this morning. He would like to know if we have heard of anything further. It seems to be quite strange that the War Dep’t never notified him as to how the six crew members were killed. Perhaps nothing ever did happen to them but just that the German Gov’t reported them “Killed in Action.” God! may this be true – and they should come home soon – George is the only one person who can really tell us what did happen. I can’t say the weather here has been very promising – we’ve been having some real Oct. weather. The temperature was down to 45 and 50 degrees and a top coat is still necessary. Sorry to know that Mr. Farrar hasn’t been well. Mr. Peluso hasn’t been taking all this too easy either. I have to keep giving him courage – as for myself – I’ve been keeping my chin up. For I know with all my heart, Yono, is safe, but I do believe he must be wounded. The next letter to arrive at the Farrar household was from the father of the Lead Banana’s co-pilot, David Franklin Albrecht. Louis M. Albrecht was pastor of the Congregational Church in Scribner, Nebraska. We have been wondering whether you have heard anything more about your boy. If you have we want to know. We do hope that he wasn’t killed and that he will come back to you. Our boy David was finally declared killed. We had a memorial service in his memory March 25. Our other son is still in Germany. He was wounded last winter but is back with his company. He was in the last two month’s of fighting. Our daughter-in-law was with us two months this past winter. We surely enjoyed the baby. She is the sweetest little thing we have ever seen. The people around here are keeping up their spirits very cheerfully. They have all been so kind to us. There are many others who have tragedies to bear. We like this town and our work. We have two girls. One has just graduated from High School and the other is eleven years old. There are many things to keep us busy. If you have time will you please let us know what you have heard. Our prayers are with you and for your boy’s safety. What is war? Not why is a war waged, but what is war, what does war really mean? I ask myself this over and over, especially as I read these letters from the families of the boys lost in WWII. The most overwhelming answer I come back to again and again is that war is the destruction of family. Take the family of David Franklin Albrecht. A mother and father lost their son. Two young girls lost their brother. A young wife lost her husband. And an infant daughter lost the father she never had the chance to know. David Franklin Albrecht died before she was even born. Back in 1944, he didn’t know if he was going to be a father to a daughter or a son. That kind of technology didn’t exist. Is there any tragedy in life worse than the destruction of family? Two planes collide in the heat of battle over Magdeburg, Germany. Of the eighteen men on the two planes, only four survive to continue their lives and continue their families. The families of fourteen men are destroyed at the instant of ten minutes past noon on September 28, 1944. So now that we know what war is and understand what war does to families, now we can ask “Why is war?” David Franklin Albrecht’s daughter and I would like to know why the ultimate conflict resolution must be war and family destruction. George Edwin Farrar, sole survivor of the Lead Banana on September 28, 1944, had been liberated and was expected to return home to Atlanta, Georgia in the near future. He had written a letter to Mr. and Mrs. Buslee, parents of the Lead Banana’s pilot, John Oliver, (Jay) Buslee, while recuperating in France after also surviving POW camp and the Black March. Mr. Buslee wrote to Farrar’s mother in response. 79 East Lake Terrace, N.E. We have just received a letter from George stating that he is in France, and this I infer means that he will return home. For his sake and yours I hope there is no delay in his getting home. Naturally he was very brief when writing to us and so we hope that he is in the best of health. Further, we would like very much to have a talk with him when he returns and so would appreciate hearing from him as soon as he gets home so that we can arrange for a trip to Atlanta to have a personal visit with him, which of course would be more satisfactory as it is difficult to cover in mail the subjects that we would like to discuss with him. I am addressing this letter to you, but it is really a reply to the letter written by George, and I trust that he will so consider it. Would appreciate receiving your telephone number in the event we should desire to call you on long distance telephone. For your information in the event we would request your telephoning us at our expense, reversing the charges, our telephone number is PARK RIDGE 541-J. Sincerely hope that you have had equally good news pertaining to your other boys in the service. According to my dad’s youngest sister, Beverly, Mr. and Mrs. Buslee did indeed visit the Farrar’s in Atlanta after my dad returned home from the war. Beverly was only eight years old at the time, but she remembers them visiting with my dad and his mother in the living room of their home at 79 East Lake Terrace. My grandfather was very ill and bedridden and was not at this emotional meeting. One more memory from my Aunt Beverly – as I have said, she was only eight years old when my almost twenty-four year old dad returned from the war. He had been a slender man when he entered the war, but after spending seven months as a POW in Stalag Luft IV and on the Black March, he returned home smaller than my eight year old aunt, even after months of recovery and recuperation before coming home.